Yes, this week I am officially late getting my post done. If I can survive October, possibly November will be a tiny bit less busy. My design/print work has been steady this month, there has been all the work at the farm trying to get ready for winter and home improvement projects going on as we gear up for remodeling Danny’s house. After weeks of non-stop work, including Sundays which is normally my true day of rest, Danny and I decided we needed to have a day off. We had a wonderful second annual chicken stew with his family, but the preparation wore us out. When we started out with our garden a couple of years ago we decided we wanted to keep it organic and as much as possible use heirloom varieties of plants. There is an unused pasture on the farm that has been designated as the new orchard. 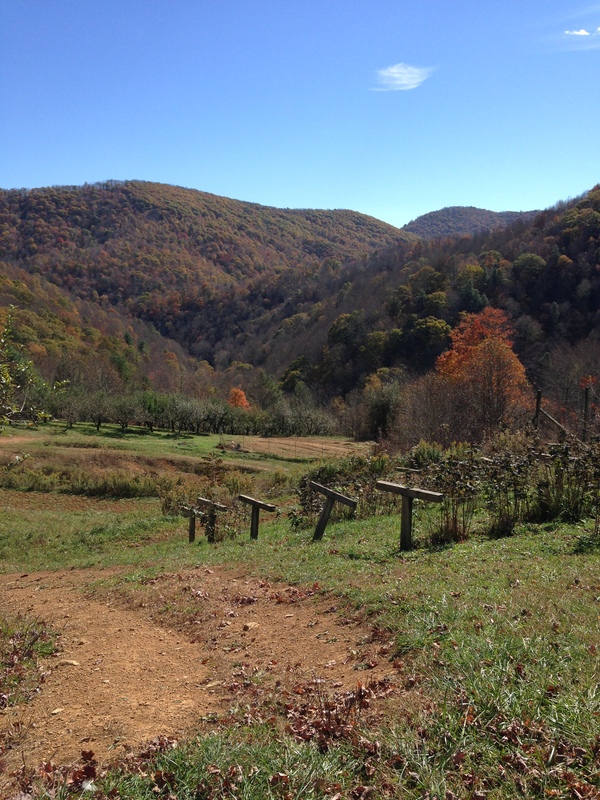 Danny went online to research heirloom apples and came across Big Horse Creek Farm here in North Carolina. He decided to order several varieties of apple trees from them. They can ship the trees, but since we were less than two hours away we decided to pick them up instead. Easier said than done! Ron and Suzanne usually have their trees at the West Jefferson Farmers Market on Saturdays. We haven’t had a free Saturday in months and Danny works every other Saturday. We asked if we could pick them up at the farm and they told us they had a very difficult driveway to navigate. Danny assured them that his Ford 250 was up for the challenge and after a few more emails to coordinate times we had a plan. That is the back story of what turned out to be a wonderful day off this week. Our plan was to head out Wednesday morning to West Jefferson and check out the town. Neither of us had been there before. We like exploring antique/junk shops so we stopped along the way to poke through all sorts of antiques, pretend antiques (you gotta watch out for those) and just plain old junk. Fiberglass surf boards sitting in a NC mountain town “antique” store look very odd. Next we had lunch at a restaurant in West Jefferson that had some good reviews (Boondocks Brewing). There is a well known restaurant called Shatley Springs that we considered, but most of our home cooking is the same type of food so we wanted something different. Then it was time to head out to the Big Horse Creek Farm. When Suzanne said their driveway was difficult, this is what she meant. 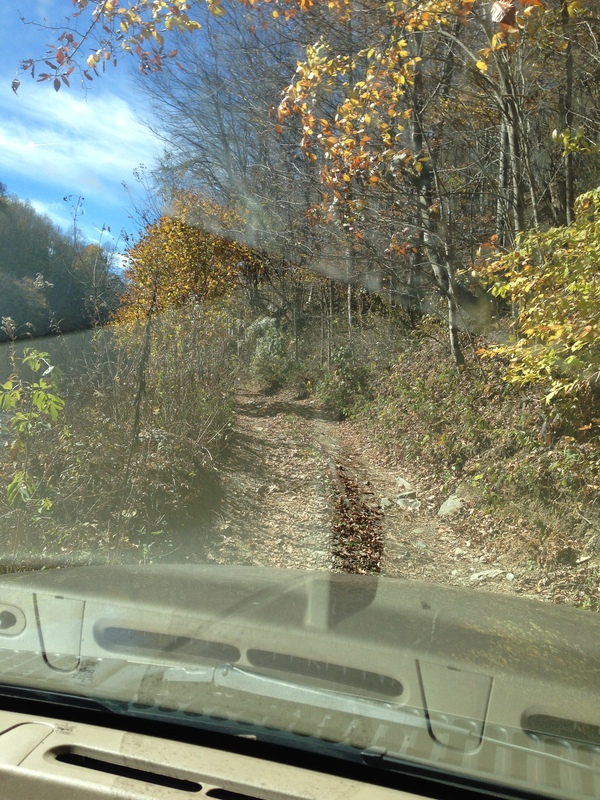 This is the bottom of Ron and Suzanne’s driveway where we decided to go into four wheel drive. One and half miles, up the mountain. We took it in four wheel drive all the way up and all the way back down later. Danny loved it. The drive was well worth it for the view and the chance to meet the Joyners. I don’t think we would have had the opportunity to get to know them if we had picked up the trees at the farmers market. Notice that small structure with the domed top. 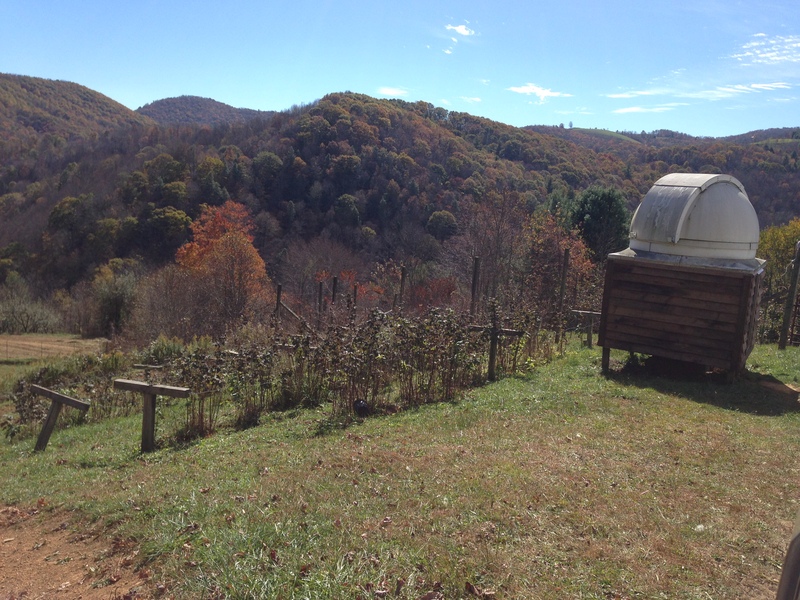 My first thought was “that looks like an observatory” and yes, it is Ron’s observatory. Suzanne told us that they have virtually no light pollution up there and can only see three distant lights at night so it is perfect for Ron’s astrophotography. You can see some of his photos on their Big Horse Creek Farm Facebook page. Then I noticed their solar panels. 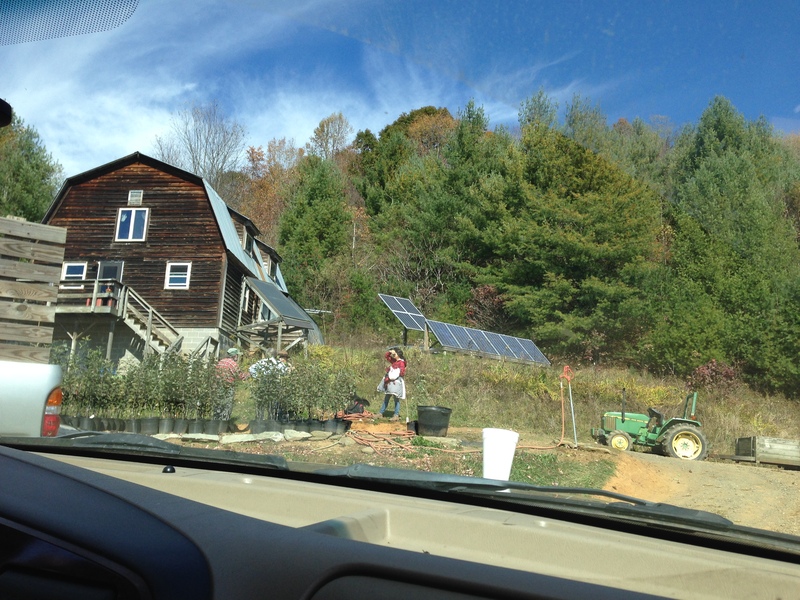 I hope eventually we can add solar power to the farm so I asked about those and Ron and Suzanne have been completely off grid since 1997 (correct me if my memory is wrong, Suzanne). No power runs up the side of that mountain. They also have a wind generator. This is the view over their orchards so the panels have a perfect south facing open area. I would never get tired of looking at those mountains. After that we talked about how they built their home and the other structures on the property themselves, chickens, deer hunting, gardening, collards and crowder peas. I think the topic we discussed the least was apple trees! It was a lovely visit and we might have to add on to our orchard to have an excuse to go visit again. Here is the link to their website, Big Horse Creek Farm. Our original plan was to pick up the trees then head back to Danny’s, saddle up Christy and Bob for an afternoon of horseback riding. We spent so much time with Suzanne and Ron that we did not have enough time left to get back and ride so we decided to explore the back roads of God’s country. I have been blessed to visit most of this country and there are many beautiful places, but this area is the only one that I have found that I would up and move to in a heartbeat. 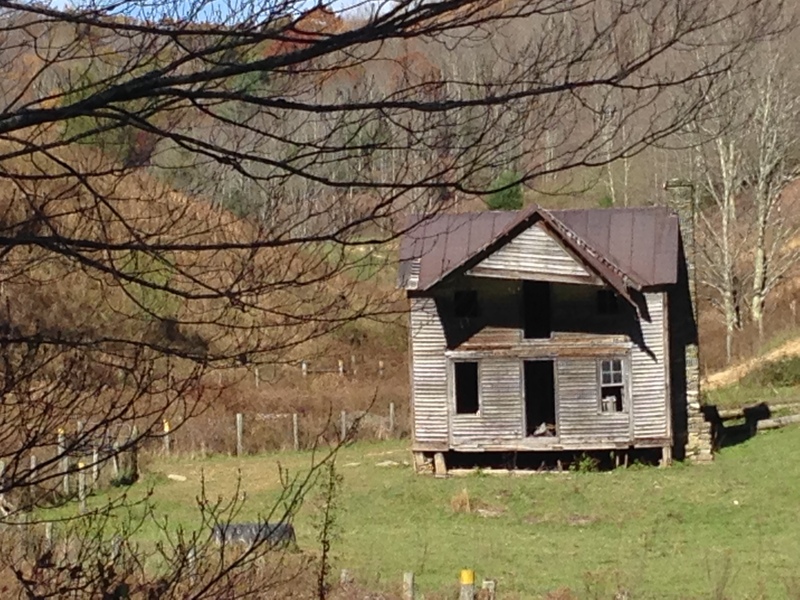 Here is an old farm house we drove by in our travels. What a gorgeous Fall day to explore. My only advice is to plan a trip, but don’t stick to the plans too tightly. You never know who you might meet or what you might see that will be worth spending extra time with. Wishing you a wonderful, adventurous week! So glad you enjoyed meeting the truly amazing Joyners. They have built their home, their orchards, and their thriving, unique “heirloom apple tree” business with their own very hard-working hands and have so fortunately, had the help and support of great workers and friends to support their endeavors. I, personally, am in awe of their tireless energy, its resulting creations and their continuing hard work and dedication to their vision of preservation of our land’s beloved varieties of apple trees. It is good and appreciative folks like you, who help them thrive and who, like you have generously done, introduce them and their unique business to others who have an interest in preserving the treasures of heirloom apple trees for generations to come. Thank you so much!